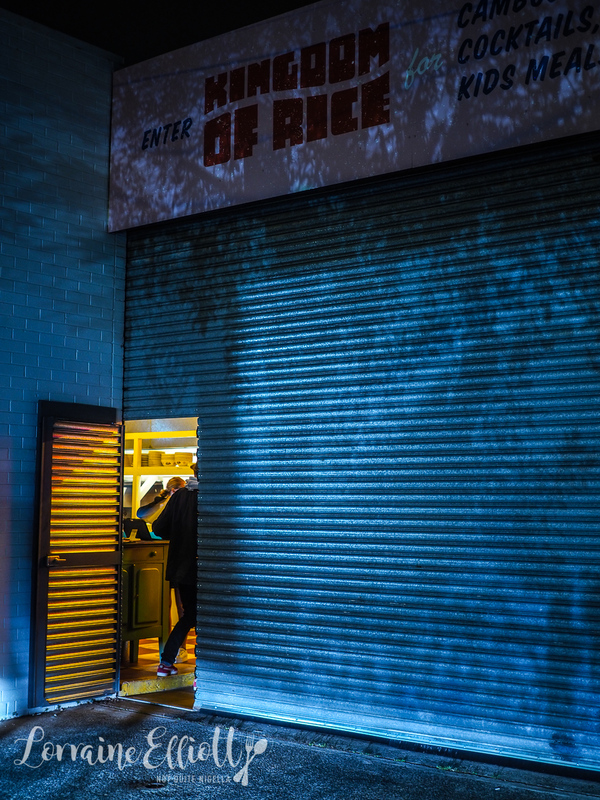 The Kingdom of Rice is the new restaurant that replaced the pop up restaurant Mr Liquor's Dirty Italian Disco, connected to the Tennyson Hotel in Mascot. 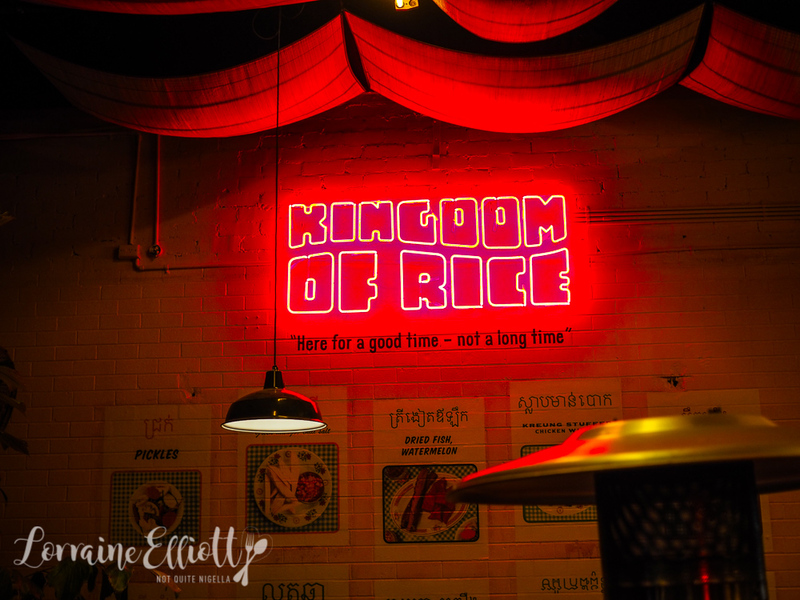 In place of Italian food, Kingdom of Rice focuses on Cambodian cuisine, a not very common or well understood cuisine in Australia. I became so excited at the idea of eating a Cambodian restaurant that I told Mr NQN about it saying that we'd be able to relive our 2 week holiday in Siem Reap from a couple of years ago. Except the foods that we had there are most likely not to feature here at this Merivale venture. Although it is pitched as Cambodian street style food, the Cambodian street food that we saw tended to have a lot of insects, stuffed frogs legs, tarantulas, tropical fruit and a plethora of really interesting desserts. 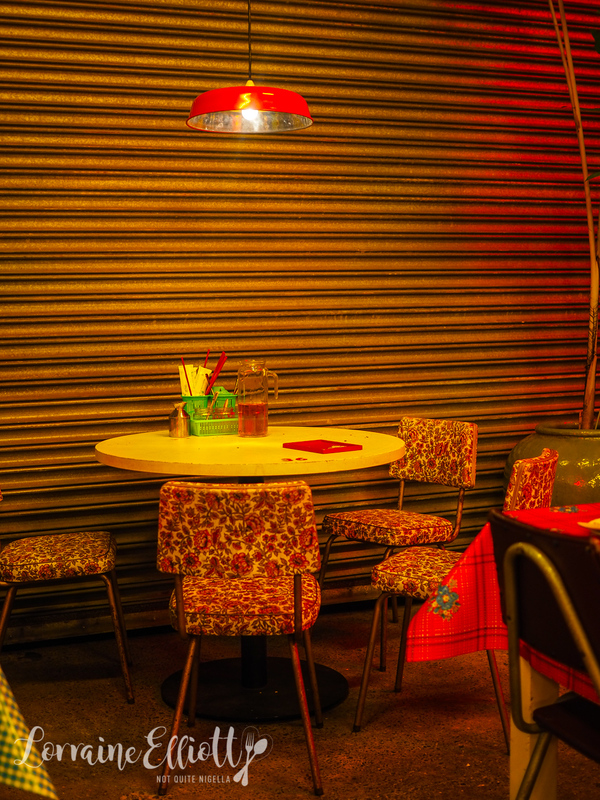 They've transformed the drive through garage to give it an attractive street stall Asian style vibe (except tonight it's freezing and raining). Ivy and Ryan are already waiting for me and Mr NQN arrives shortly after. 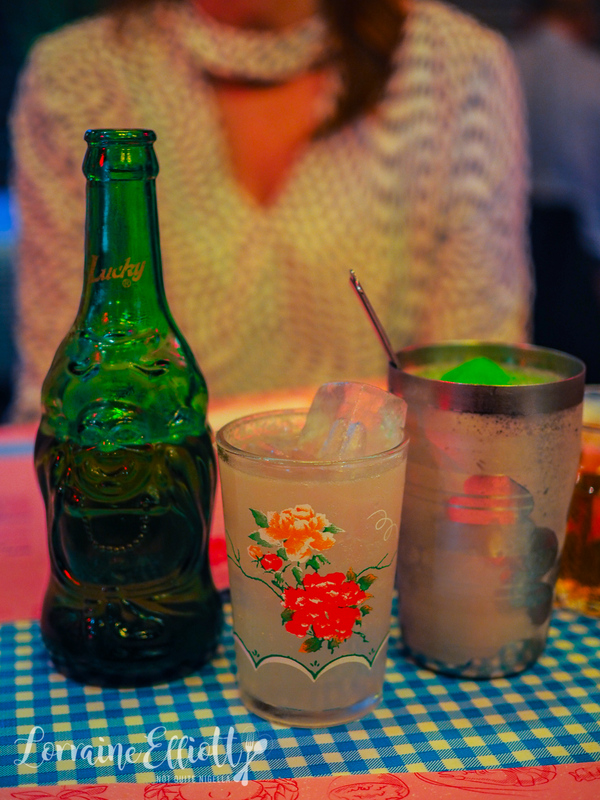 We order drinks - a Pandan Pina Colada (Havana Club Especial rum, coconut, pineapple, pandan, sugar cane) for me and a Papaya Paloma (Olmeca Altos tequila, papaya soda) for Mr NQN while Ryan has a beer and Ivy a glass of Chablis. There is still also the self serve wine cellar alongside the restaurant. 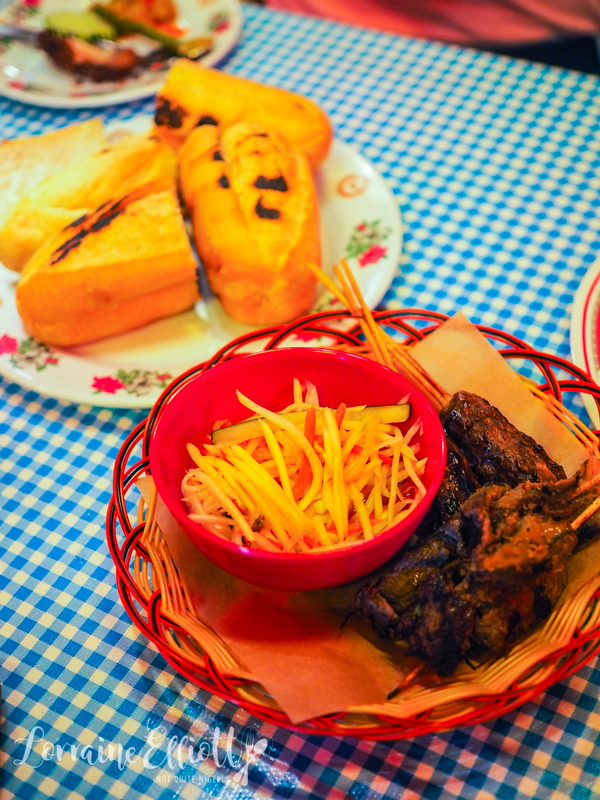 Service is incredibly friendly and welcoming and we chat to our waitress about Cambodian treats like beehive (with little bee larvae nestled in every honeycomb cavity) but she says that it's very unlikely to ever pop up on the menu here. 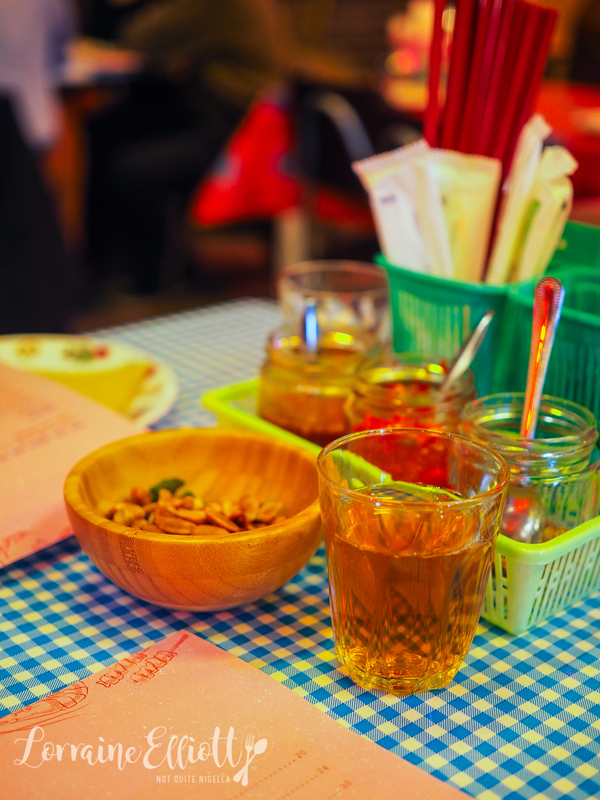 There are complimentary kaffir lime leaf flavoured roasted peanuts and top ups of cold brew jasmine tea for each table. The chefs are Mitch Orr, Cam Fairbairn and Lillia McCabe. My favourite dish in Siem Reap was prahok k'tis. It's a pork mince dip served with crudites. Prahok is the pungent fermented dried fish paste made from snakehead fish which is used to flavour many Cambodian dishes. As expected they tread quite gently with this ingredient and prahok k'tis is made using prahok, kreung curry paste, pork belly mince and kaffir limes. To accompany the dip is cucumber, carrot, white eggplants and snake beans. It is pretty fabulous and we like them so much that as soon as we finish, we order another. 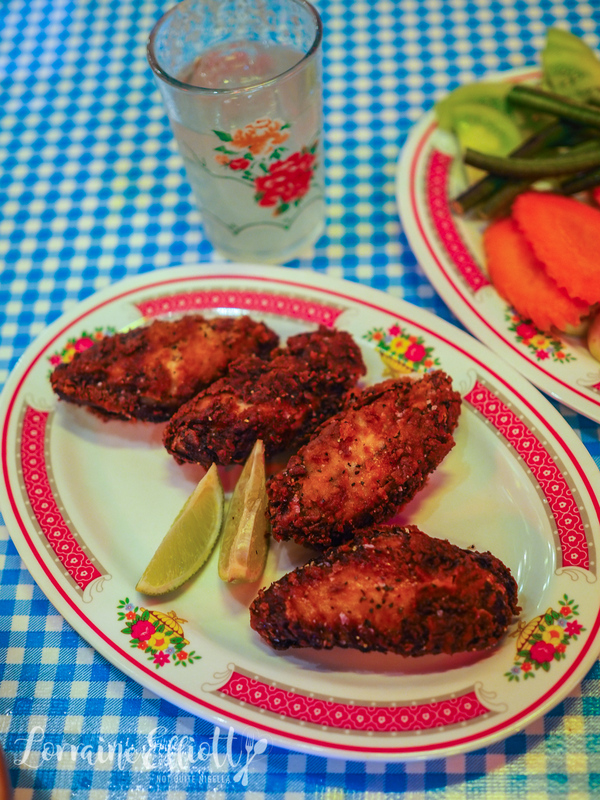 The chicken wings come four to a serve and are crunchy and dark golden. They're said to be stuffed with kreung which is a flavoursome curry paste traditionally made with lemongrass, galangal, ginger, shallot, kaffir lime leaf and zest, chilli and lemon ants (probably not lemon ants in this version) but we don't get much of this flavour at all. They're just like regular deep fried chicken wings. The skewers come out next and there are two per serve. We ordered two types: the lemongrass beef and the caramelised pork. There are two baguettes. We preferred the slightly more complex flavour of the caramelised pork and the lemongrass beef was really missing a lot of lemongrass flavour. And whilst filling your own half baguette seems like a nice idea, the baguette is mostly left behind as there isn't enough filling to go into the thick baguette. Perhaps if the baguettes were thinner or we had had more of the pickled green mango salad to put in it the ratios may have been right. There just wasn't enough of this which prompted us to question whether we got one serve of the salad and not double as we had ordered two types of skewers. I remember one whole day in Siem Reap spent chasing elusive Lort Cha noodle makers who had all packed up their enormous wooden noodle makers for the day. I think at the point Mr NQN was wondering whether it was a good idea to be married to someone that went on wild noodle chases while on holidays. These short, rice flour noodles are called rice drop noodles and resemble worms with a lovely chewy texture and a little breath of the wok. 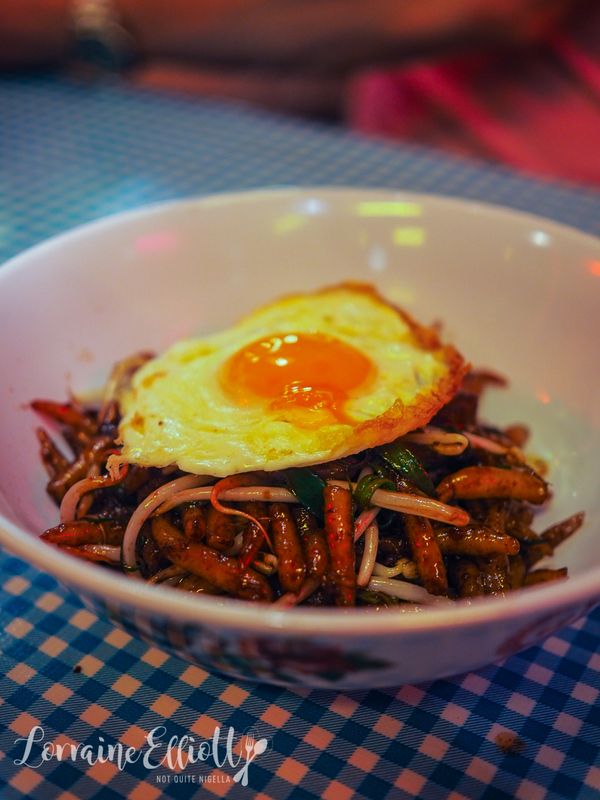 They're stir fried with bean sprouts, green shallots and a fried egg on top. 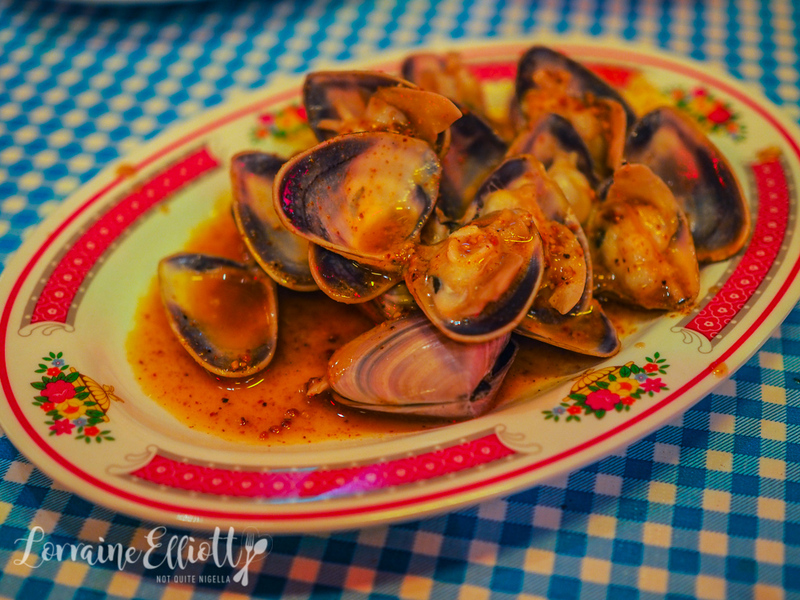 It's a small serve of plump pippies cooked with lime and kampot pepper. The citrusy lime is very strong taking over all the flavour. It's so limey it's almost sherbetty and you'd really want to like sour flavours to appreciate this. 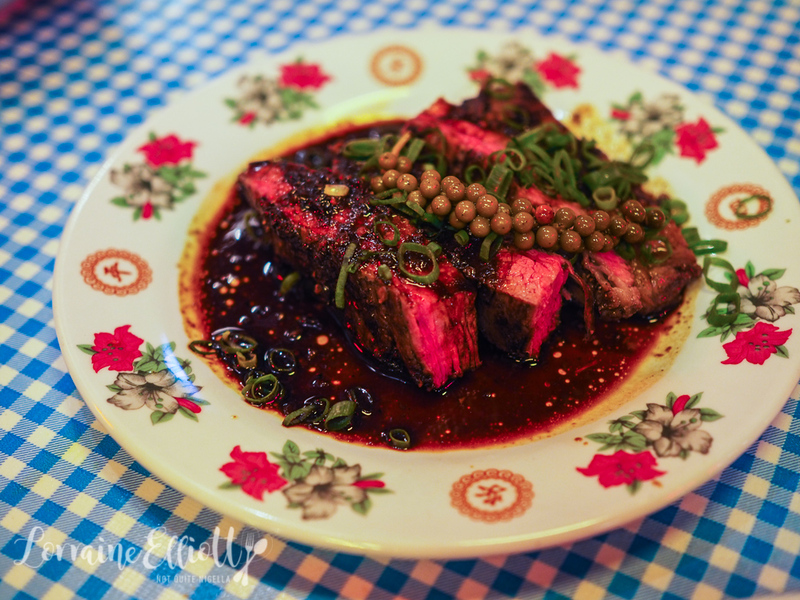 Our last savoury dish is the Rangers Valley flank steak that comes as four thick slices of medium rare steak with shallots and green peppercorns on top with peppercorn sauce with a slight sourness to it. The meat is tender (one thing we found is Cambodian beef could be quite chewy) and this would be great with some rice to soak up the sauce. There are three desserts on the menu and we order all three. 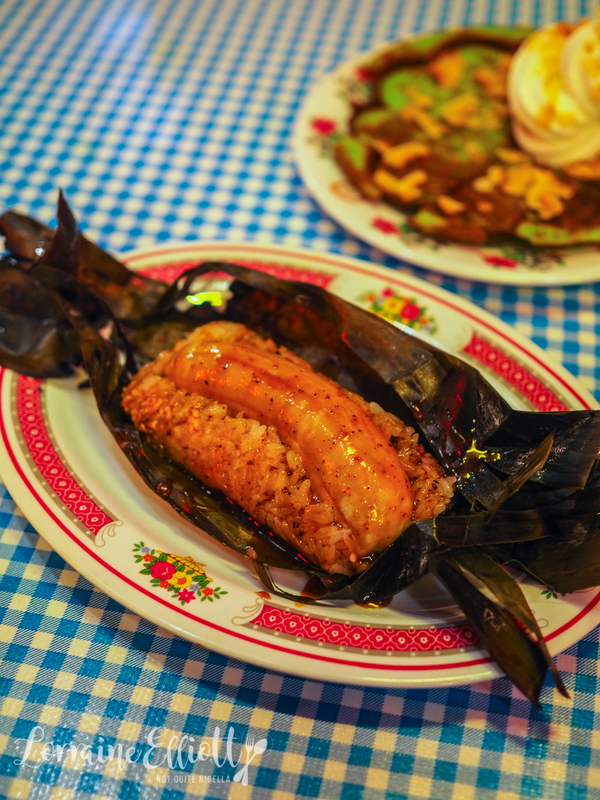 the first is a grilled banana wrapped in sticky rice with a star anise caramel that is wrapped up and grilled in a banana leaf. The flavour of the star anise caramel is very strong-it's very licoricey whereas we usually find star anise a subtle way of enjoying aniseed. The rest of us don't really go for this but liquorice lover Mr NQN likes it. 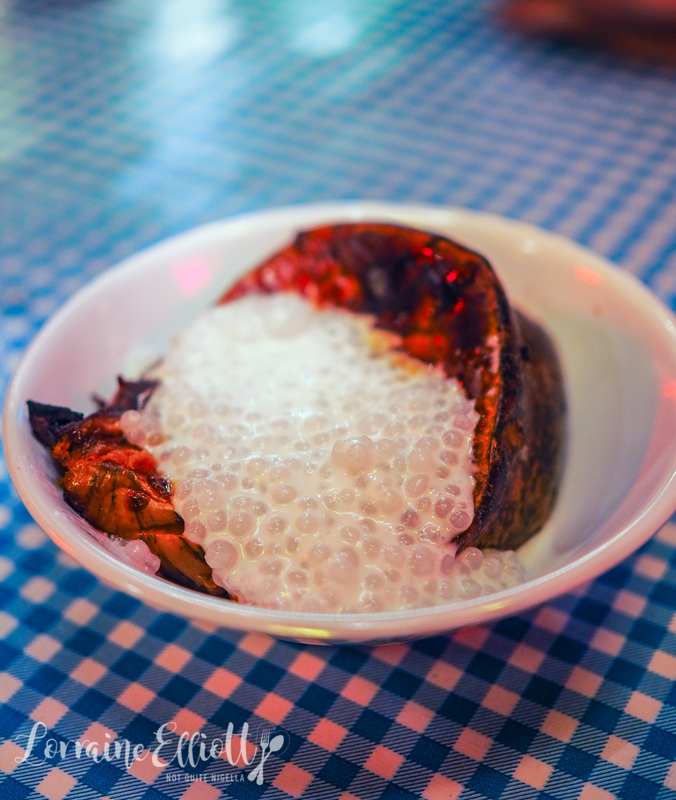 The Bobor Lapoav is a roasted pumpkin wedge topped with tapioca and coconut milk. We would have loved more coconut milk or coconut cream on this. The most popular dessert of the three of the pandan waffle with a tangy, refreshing coconut sorbet and toasted, shaved coconut sprinkled on top. 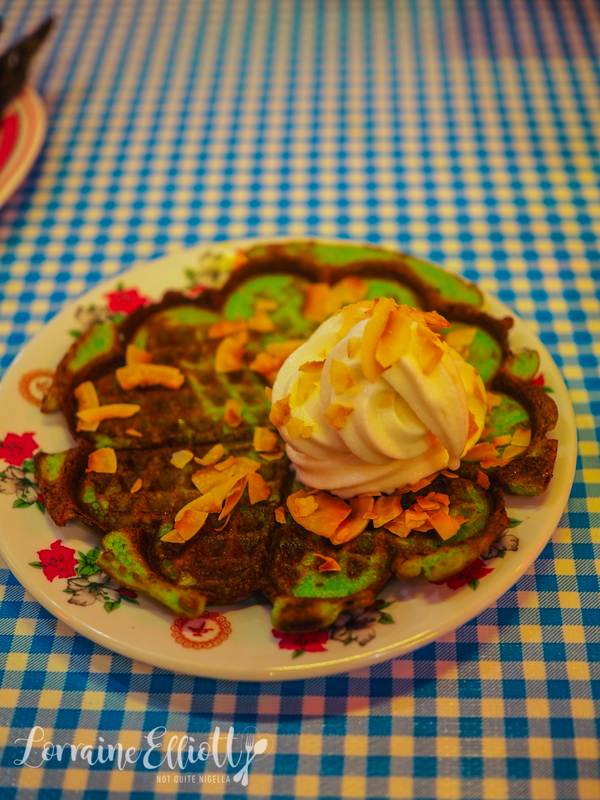 The pandan waffle is appealingly crispy edged too and softer towards the centre. And as we finish it's exactly 2 hours after we've arrived and we need to give back our table. 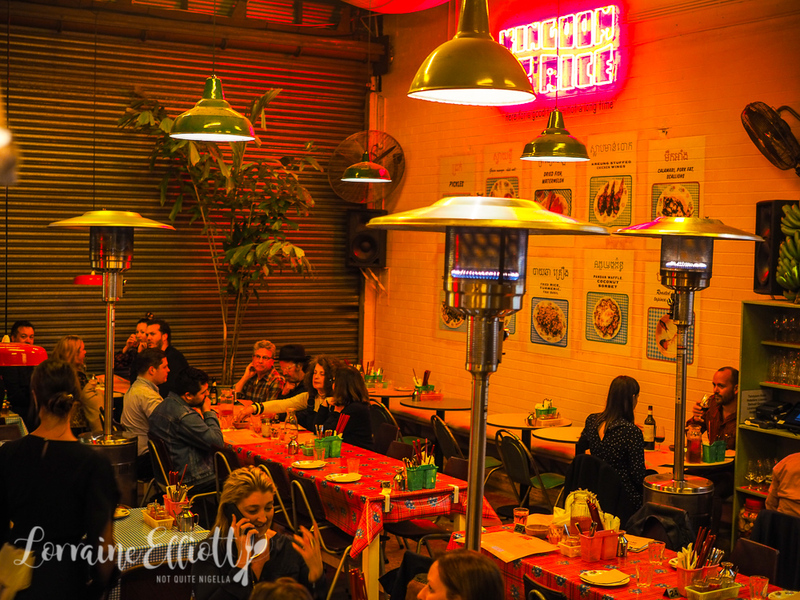 So tell me Dear Reader, have you tried much Cambodian food? 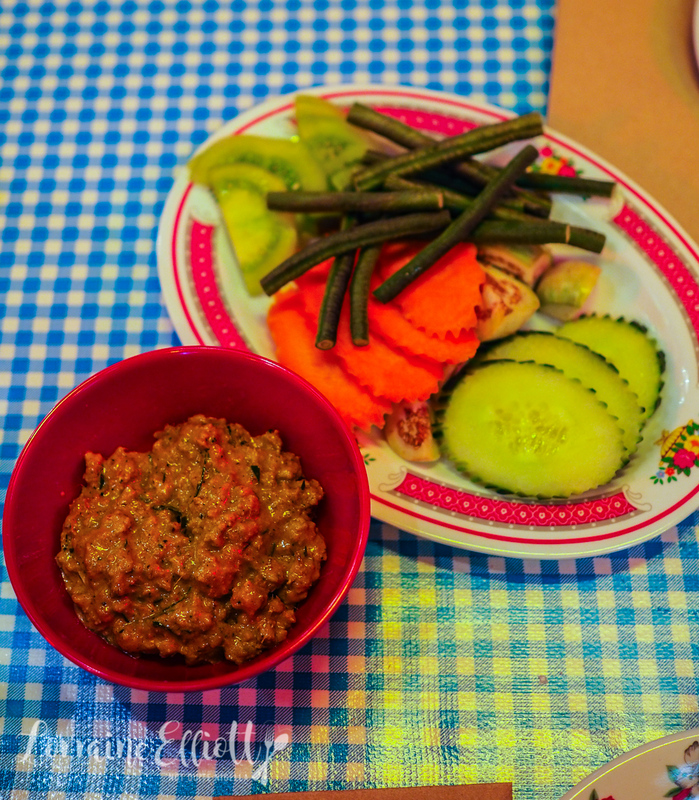 Do you like using ingredients like fish sauce or prahok to add saltiness to food? And would you ever eat honeycomb with larvae in it if it was offered to you?